Those words from quarterback Tyree Jackson accurately explain how the UB Bulls football team is dealing with a new level of expectations. They are leaning on their head coach, who knows a few things about expectations. There has never been this level of hype and excitement going into a Bulls season. A six-win, bowl eligible 2017 season that ended with three straight wins has fueled that. So has returning 14 starters, including all their key players on offense and the nation’s #2 tackler. A steady stream of visiting NFL scouts and pre-draft hype focused on receiver Anthony Johnson and Jackson has elevated the attention. Leipold won six NCAA Division III championships in his previous stop at Wisconsin-Whitewater. Which means at least five times (in reality more) he’s dealt with high expectations. As Jackson points out, Leipold knows everything about winning. So how is the coach using his past experience to get his 2018 Bulls ready? Yes, the quickest coach to 100 wins in NCAA history is ignoring his past, and not letting it effect this different team in this different year. But that doesn’t mean that Leipold hasn’t learned how to send the proper message about expectations. As for the six Bulls players who have been named to ten different national watch lists at their positions, Liepold has an easy way to make sure they stay focused on their jobs. The Bulls players know and feel the hype. They see it on social media, read it in preseason predictions (Bulls are picked to finish second in the MAC East), and hear it from their friends, family and fellow students. While it may be new at UB, it certainly is welcome. “It’s a blessing. We thank God that we’re in the position we are and have the hype that we have. But that doesn’t mean anything on September 1st. Delaware State will be ready, ” says Jackson. “It’s exciting. We’re not looking ahead. We’re going to work every single day. No matter what people say we have to go out and do it ourselves. It’s definitely exciting and we see flashes of it. It’s fun,” added wide receiver K.J. Osborn, who will team with Johnson as top targets for Jackson. The players know that winning is the most fun. But it only happens with hard work and good practices. The hype ends when the first game kicks off. That’s where the lessons that Leipold has learned kick in. The Bulls have key players who have put in the hard work at the lowest level of college football. 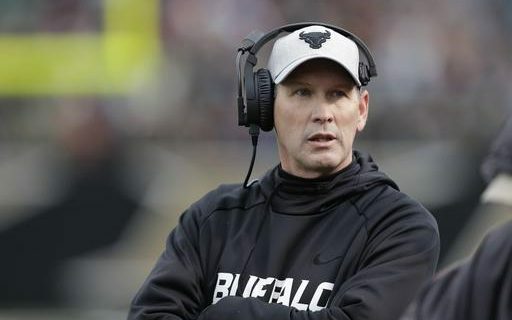 Read about the JUCO Bulls and their path to success in Buffalo.